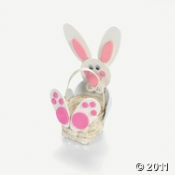 How about this Bunny Egg craft kit that is easy for kids to put together. 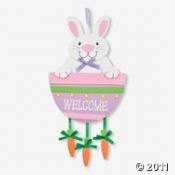 This Bunny and Carrot Door Hanger Craft Kit is just one way you can have lots of fun at a kids Easter party, an Easter Class party at school or anytime at all. These are some of my favorite fun and easy kids craft kits and you can find them all at my favorite craft supplies store...the Oriental Trading Company. 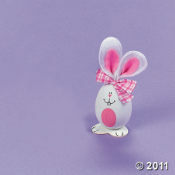 You can see this Bunny looks like an Easter Egg and is cute as can be. Your child is going to enjoy making this craft project. I always bring craft kits to a kids party. They are fun and usually pretty easy to put together. It is fun to watch the kids assemble their kits and to help once and a while when they need it. The kids make a cute project and then they get to take that craft home with them...sounds great to me. Make sure you give the Oriental Trading Company a look before your next kids party. The crafts they sell are just right for a kids party, a school class party or for you and your kids to assemble on family crafts night. Easter Cake Designs Page. You can also find Easter Games. Join in and write your own page! It's easy to do. How? 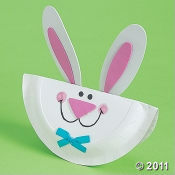 Simply click here to return to Kids Craft Ideas For Easter.